There was a time for about 10 dark years where shooters didn’t have the freedom of choice to put what we wanted on the end of our modern sporting rifles. But today, most shooters enjoy the options in the form of muzzlebrakes, compensators, flash hiders, as well as suppressor adapters. With that said, choosing what is optimal has many scratching their heads. As an instructor, I often hear “I want one that does it all.” We will get to the bottom of that in just a minute. For now, let’s review the options. Almost all muzzle devices that control recoil and muzzle rise will produce a hellacious muzzle flash. 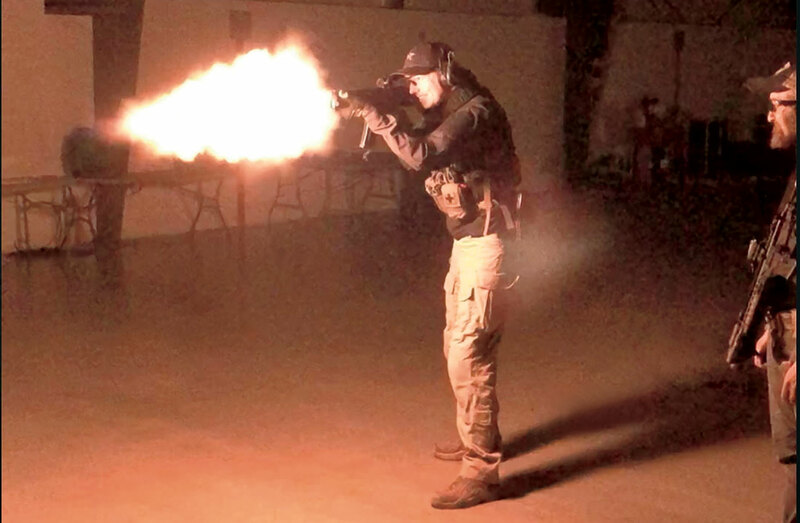 The size of a muzzle flash is relative. If you’re a competitor or only conduct training and missions during the day, a muzzlebrake can be good. These devices do not produce a significant enough amount of flash to bring the heat on your shooting position. However, when the lights go out, you might want to think twice about using a muzzlebrake or compensator. In low light or at night, muzzlebrakes, compensators and blast diverters will light up a shooting position and give bad guys a target or direction to fire. Once upon a time in a land far, far away, a terrorist made a run for it and my team gave chase. Somehow, we ended up in a nasty street fight that kept us in the dark well after our bed time. As time ticked by, the terrorist tried harder and harder to get into a position to either shoot at us or throw grenades and launch RPGs. When a soldier would return fire, the terrorists would zero in and shoot at his muzzle flash. After this event, there wasn’t another night in the streets that I didn’t think about ensuring I was not putting out an unnecessary signature that would invite a hail of bullets to our position. OK, a little light-­hearted combat story, but in the end, it would behoove the soldier or Marine fighting overseas to extinguish the flame thrower. Inside our borders, we should also heed this warning as we conduct night-­time operations here as well. Using a compensator when shooting around and under vehicles also stirs up quite a mess. The additional blast will knock off the last 20,000 miles of dirt from under a car in just a few shots. If you do choose a muzzlebrake, play around with the timing to see where you get the most benefit. By timing, I mean which side is oriented to the top of the compensator. 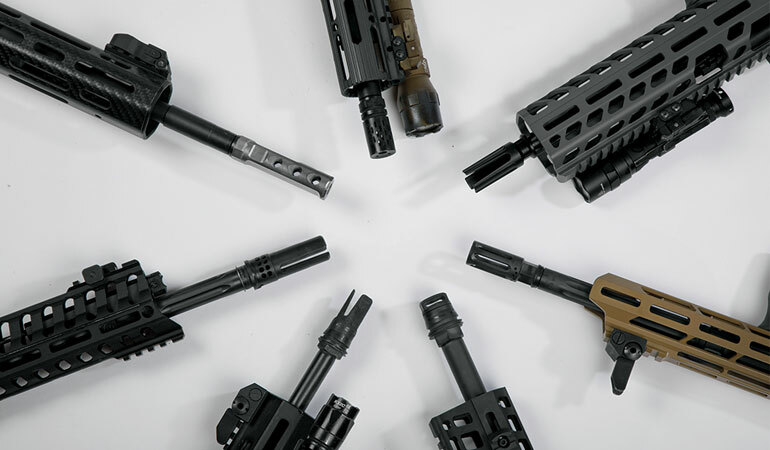 Several of these devices are made for left- or right-­handed shooters and are intended to be rotated just enough to give the shooter the most benefit with regard to recoil and muzzle rise. Take your time to get it right, then use a crush washer, additional shims, or a high-­temp thread locking compound such as Loctite or Rocksett to keep the thing put during extended shooting sessions. If a compensator is your final choice (or your state requires one), then I would select either a Battle Comp Enterprises’ BattleComp (battlecomp.com), a Bravo Company USA compensator (bravocompanyusa.com) or a Surefire muzzlebrake (surefire.com), which also doubles as a suppressor mount. If you enter a room with your special operations or SWAT team, the last thing you need is one or all of the team having a carbine that is twice as loud, throwing concussion at the faces of their fellow assaulters and that lights up the room. In a tactical scenario, I would recommend against a brake or compensator. Again, for the field of competition – no problem – but in a world of pop-­up, shoot-back targets, I would highly recommend a flash hider over the compensator. If you are planning to use a muzzlebrake or compensator, having one that allows for the attachment of a sound suppressor is a good idea. These devices will allow you to get the best from both worlds. During daylight hours, you can reap the benefits of controlling recoil and muzzle rise and at night you can attach a suppressor, which is the best compensator out there, while also producing less muzzle flash and reduced noise. Most suppressors do not quiet the carbine enough to make the situation ear safe, especially indoors, so plan on using hearing protection. Surefire and SIG Sauer (sigsauer.com) make good brakes that also adapt to their brand’s sound suppressors. “Easy on and easy off,” I say. If you decide that using the suppressor is for sound muffling as well as minimizing flash signature, ensure you buy the right can. If you have a short-­barreled rifle, I wouldn’t buy the shortest silencer on the market. I would buy one that is made to do its job on a short barrel. Normally, a suppressor that is at least 6 ­inches in length for anything shorter than a 12.5-­inch, 5.56 platform, as an example. If you use a 14½-­inch or longer barrel, then using mini-­suppressors are fine. These mini devices often add less than 5 ­inches to your platform’s overall length. Remember, we are using the suppressor to divert the sound signature and extinguish as much flash as possible. A blast diverter sounds like a position similar to duck-­and-­cover awaiting a nuclear attack, but in reality a blast diverter is a device that pushes gases and blast away from the shooter. These devices can still throw a huge flame, but they work if you plan to shoot from a car through its windshield. (It’s a good way to clear out the glass a little faster.) Other than that, I don’t see too much use for them, aside from a training device affixed in place of a suppressor. John Noveske (noveske.com) was the first in the business to make these devices popular with his KX3 flash suppressor, complete with a little piggy logo with a huge flame coming from its mouth. The picture says it all. These devices are nice to be around on the range since most of the blast and noise goes down range away from the line. I must say that I prefer a slick barrel on a bolt gun. This will be less obnoxious for you and your hunting buddies when you shoot, but if you are carrying a howitzer, you may need a little help with managing recoil. I have one particular rifle that is carbon fiber, light as a feather and oddly chambered in .375 Ruger. As you might guess, it’s a little jumpy. I actually called my wife and told her to come get me if I shot the rifle and didn’t text her. So, I cranked off a round and the rifle knocked the glasses off my nose, turned my ear pro sideways and baseball cap askew. I definitely needed a muzzlebrake. When I did shoot the rifle with a muzzlebrake from the prone, it was as though a mortar round impacted at the end of my muzzle. This brake has vents all the way around and it took 5 minutes for the leaves and dirt to stop falling on my head. It was super loud as well. So, for hunting I knew I had to wear hearing protection — no matter the scenario. Last, but not least, is the lonely old flash hider. Somehow the big blasting compensators that throw heat and flame at the target have become all the rage. In reality, what we need is a better muzzle-­flash hiding device. B.E. Meyers Advanced Photonics (bemeyers.com) seems to have refined their device to the point that even great companies like Surefire have licensed the use of its design. The original B.E. Meyers had tines that occasionally made an annoying tuning fork ring, but now many companies also make versions with a closed-end design that work well. Even the Yankee Hill Machine (YHM) Phantom (yhm.net) works exceptionally well. Phantoms are still one of my favorites. The latest and greatest would be the combination of a compensator to eliminate the rise of our sights as we shoot and the flash-­diming qualities of a flash hider all in one. Many have purported that they build such a device, but, until recently, I would say they didn’t deliver as advertised. The only device I have seen so far that makes a claim to be believed is from Surefire with its Warcomp-­556. It has a few compensating directional ports to keep you on target, and the front of the device works as a flash hider. It doesn’t extinguish the flash as well as a true flash ­hider, but it works exceptionally well. We are extremely lucky to be living in a time when all of these devices are immediately available from a plethora of sources for you to buy and test or test and buy. Figure out what you need for your particular application and shoot away. You just have to determine if you need to reduce recoil, flash, muzzle rise or noise.